Crews from West Sussex Fire and Rescue Service were called out to a fire in a first floor bedroom in Sussex on Friday night (June 16), according to a spokesman. 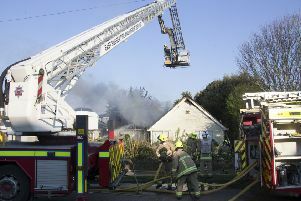 The fire broke out at a property in Ilex Way, Goring, shortly before 7.30pm. A spokesman for West Sussex Fire and Rescue said: “We sent two engines from Worthing fire station after a call came in at 7.30pm. “The fire was in the first floor bedroom of the property and damage was caused by heat and smoke. The cause of the fire is being treated as accidental, according to the fire service. The spokesman added: “Four breathing apparatus and two hose reels were used before crews left the scene at 9pm.